Create account yourself – click on SIGN UP in rihgt upper side of every page and insert your contact information including an e-mail address. Email address must be a valid, we will use this address for confirmation your registration and any purchasing activity on the website. Content of EN standard is always the same! What is CSN standard - CSN - is a mark for Czech national standards. If standard is published as CSN EN, it has status of European Standard with original english text. What is ILNAS standard - ILNAS - is a mark for Institut Luxembourgeois de la Normalisation, de l’Accréditation, de la Sécurité. If standard is published as ILNAS EN, it has status of European Standard with original english or french text. What is UNE standard - UNE - is a mark for the Spanish Association for Standardization and Certification ​(AENOR).. If standard is published as UNE EN, it has status of European Standard with original english or spanish text. When will be my standard available to download? All PDF files will be upload to the DOWNLOAD area in your account. Once the standards are uploaded we will inform you via e-mail your download is ready. 1. 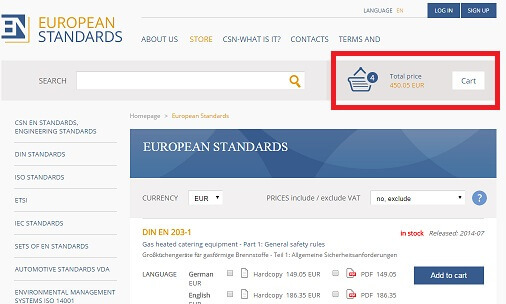 Choose format of standards (PDF or Hardcopy), add the standard into shopping cart. 4. Insert your business data (your account will be created automatically) or SIGN IN. Follow the instructions in the order form. website. Login to your PAYPAL account and confirm the ammount. BANK ACCOUNT ADVANCE PAYMENT - after ordering you will receive by e-mail a proforma invoice with details for bank transfer. All bank transfer payments incur a fee of 16 EUR. PDF* - Portable Document Format - an electronic format. The file will be upload in your account in bookmark DOWNLOAD. Before opening please save the file to your PC. All our files are in printable format. Adobe Acrobat Reader software is required to view PDF files on your computer. This is a free download from the Adobe website.